SOS Children's Villages has been active in Finland since the 1960s.The SOS Children's Villages idea was well received in Finland and the organisation's activities have continued in recent decades. At present, SOS Children's Villages supports children, young people and families in six locations in Finland. 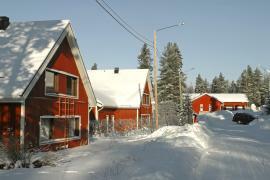 There are six SOS Children's Villages, one SOS Youth Facility and 13 SOS Social Centres in Finland. Finland is a republic in Northern Europe and borders Russia in the east, Sweden and the Gulf of Bothnia in the west, the Baltic Sea and the Gulf of Finland in the south, and Norway in the north. Nearly one third of the country lies north of the Arctic Circle, and can be covered by snow for more than six months of the year. The population is 5.3 million. Finns constitute more than 93 per cent while persons of Swedish descent account for about six per cent. Finnish and Swedish are both official languages and there are also Lapp and Russian speaking minorities. More than two thirds of the population live in the southern part of Finland, with the capital city of Helsinki being home to about one million inhabitants. Finland became a member of the European Union in 1995, and in 2002 became the first Nordic EU member to adopt the euro. 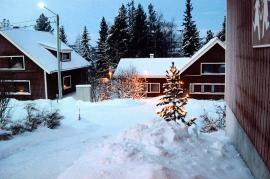 Finland has one of the highest standards of living in the European Union. The government invests heavily in public services such as health, education and social welfare. This high level of investment was threatened during the 2008-2009 economic crisis when the Finnish economy was one of the worse affected within the Eurozone. At present, Finland has an unemployment rate of 7.7 per cent (2012 est). Finland's economy has traditionally been based on the timber, paper and paper products industry. Mining was also important. In recent decades, there has been a substantial change in the economy. At present about a third of Finns are employed in public services. Other important sectors are commerce, industry and financial services. Finland's greatest success has come through the electronics and telecommunications sector, in particular Nokia. Nokia, whose headquarters are located just outside Helsinki, plays a very important role in Finland's economy. Finland is an egalitarian society in terms of both gender equality and regarding the distribution of income. For example, Finland was the first county in the world to give women the right to vote and to stand for election. Finland ranks within the top ten countries in the world with regards to income equality. Two problems haunt Finnish society: alcohol abuse and suicide. Alcohol-related deaths account for most deaths among Finnish men between the ages of 15 and 64. Alcohol is also involved in a quarter of accidental and violent deaths. The country has one of the EU's highest suicide rates; the number of men committing suicide is particularly high. Around one fifth of the population is under the age of 18. Regarding child wellbeing Finland is one of the highest ranking EU countries – this is partly due to the universal public provision of pre-school day care, school education and health. It is calculated that around 16,000 children are in care (2008 est.). In the past decades the number of children who need care outside their family has increased. According to the Finnish Ombudsman for Children more preventative work needs to be carried out with a small number of families where the problems are intensifying. Most of the families who receive support, experience alcohol abuse and related issues; mental health problems, domestic violence or inadequate parenting are often found in these households. Estimates suggest that one in ten children lives in family homes where alcohol abuse has a negative effect on their development. According to reports by the Finnish Ombudsman for Children there is room for improvement in a number of areas. Risk areas identified by the ombudsman include adolescents who start smoking and drinking at early age. Mental health problems, especially among teenage girls, are also present. Finland's high suicide rate also affects young people; the rate among 15 to 25 year olds is one of the highest in the European Union. The good news is that the rate is dropping due to suicide prevention interventions. SOS Children's Villages runs a variety of programmes in Finland. Children who can no longer live with their families can be cared for by SOS families. In addition, young people can live in special flats where they are guided on their path to an independent life with the help of professionals. The Oravanpesä holiday camp in Western Finland can accommodate around 30 children. For several years, the Finnish SOS Children's Villages Association has also been supporting the SOS Children's Villages projects outside the country. In response to the refugee crisis of 2015, SOS Children's Villages started providing care for children and young people who arrived in Finland without parental care. They live in small group homes and receive all the support they need. We also collaborate with other organisations to advocate for the rights of refugee children.